One of the most used functions in RetSoft is scanning documents. RetSoft can interact with a wide range of TWAIN compatible scanners so you don’t have to worry about which scanner you can use. 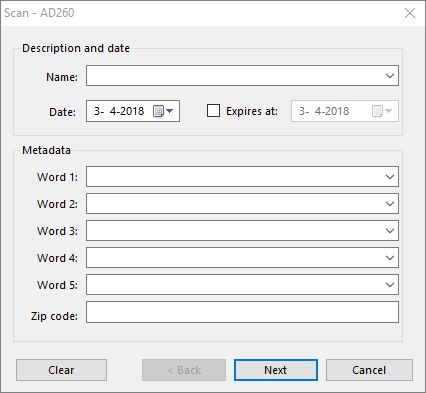 When starting a new scan you can input additional information, or you can rely on our OCR (text recognition) engine after the documents is scanned into RetSoft to find your document. You can click the scan button in the toolbar to start the scanning process. All input fields are optional, and you can change them at any time after the scan. This will be used for the file date, the default date will be today. You can input a date on which you want to filter the document to delete it from the archive. Removal won’t be automatic, you can enter a search filter and then decide if you want to delete the files matching the search parameters. This is especially important when a document will contain privacy information and you will need to treat it according to the GDPR legislation. All fields are optional, you can choose to enter specific keywords on which you want to be able to find the document when searching. This is important when scanning documents with a lot of photos, because there is no text on the page, you might want to specify some metadata to find the photo in RetSoft. Tip: you can change “word 1 / 5” via the button MetaData (top right). This way “Word 1” can be “Customer” and “Word 2” can be “Classification”. RetSoft will detect all compatible TWAIN scanners connected to your system and you can select the one you wish to use in the selection. Every document will be suffixed with an automatically incremented numeric counter. Every page will in the scanner will be merged into a multipage file. If you uncheck this box every page will become its own document. 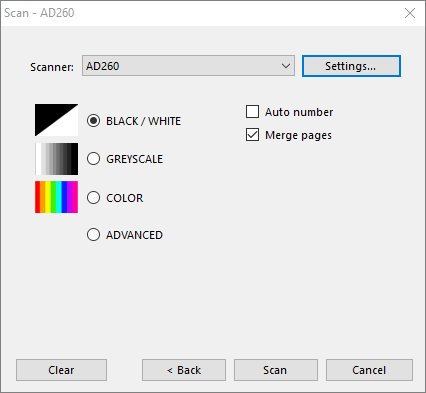 If you want to tweak the settings, choose Advanced to view the scanner settings dialog of your scanner after pressing the “Scan” button. If you have any questions about scanning, you can check the online manual, or contact the Support Team at support@retsoft.com.